Home is Where My Story Begins is Becca's home life blog. "I love to cook, bake, decorate, garden, and do it all with my kids. My tagline reads, "At the end of the day, it's all about home and family." My blog is all about making a house a home. " 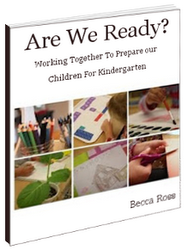 Love, Laughter, and Literacy is Becca's newest blog.
" It's a combination of my other two blogs. It's all about home and family, but it's also about creating rich experiences in our homes and with our families. I talk with parents all the time about creating engaging activities for their children. Love, Laughter, and Literacy is the place I share fun and enriching ideas which are also grounded in literacy. I believe EVERYTHING we experience in life contributes to our literacy lives. We are the sum of our experiences, even the small experiences. Let's deepen those experiences! " Mariah Bruehl writes a fabulous blog and has recently published a book about playful learning activities for kids. This book features developmental stages in reading, writing, math, science, and social studies. Each section is packed with ideas to create meaningful and enjoyable adventures with your kids.... you know, PLAYFUL LEARNING!